Dealing with the insurance company after an accident can be stressful and can leave you with many questions. Are they going to give you a fair settlement? Do you need a lawyer? Should I be agreeing to a recorded statement? (spoiler alert…NO!) Not every accident requires hiring an attorney but we wanted to ask accident lawyers around the country for some free advice on dealing with the insurance company after an accident. Here’s are the 24 tips below. Don’t give a recorded statement. Insurance companies will tell you this is routine and they always do these. Well, there’s a reason for that. They often use them to minimize your recovery. Granted, you might be lucky and the statement might not reduce what you recover in settlement, but they rarely if ever help your case. Stay away from these like the plague. Insist that your doctor bills your insurance company. Many people have private insurance they can use to pay medical bills while waiting to settle. Unfortunately, many doctors and chiropractors don’t want to bill your coverage. They would rather wait until you settle and get paid from your settlement. This is because many doctors and clinics have signed contracts with certain insurance companies to accept lower fees for their services. Waiting until the case settles can put more money in their pockets. Unfortunately it means less goes into yours. When you settle you are entitled to recover the full value of your medical services, not just what was paid by your health coverage. The difference between what was paid and what you recovered should go to you, not your doctor. After all, you were the one making payments over the years to be insured. Although doctors and clinics who do this are violating state insurance law, prosecutions are rare and the practice is widespread. Not insisting your doctor bill your insurance can mean you end up with thousands of dollars less in your pocket when you settle. You may want to use your own collision coverage than pursing a property damage claim from the at-fault party’s carrier. The reason is your carrier will repair your car first and questions later. The upside is you get your car back on the road faster. The downside is you likely will have to pay your collision deductible up front. However, assuming you are not at fault, your carrier will recover your deductible for you and reimburse you. The alternative, is to wait for the at fault carrier to talk to all drivers/witnesses and conclude their investigation until they are in a position to accept your claim. Assuming that they do accept responsibility, you are often 30, 60, 90 days down the road. All the while, you are out of a car. Another important point is that they should never give their statement to the insurance company without having an attorney present. Be extremely careful before agreeing to give a recorded statement, and it’s best to at least speak with a lawyer familiar with the laws of your state (eg, not your cousin from CA) before doing so. If a client isn’t yet ready to sign up with a contingency lawyer, then pay for an hour of someone’s time – it will be worth it. Do not settle too quickly. You have at least two years in some states (one year in some), and so there’s no rush. People sometimes assume they will recover, and so agree to a small settlement based on that, and if the injury becomes chronic there’s nothing that can be done. Attorneys, not clients, should give adjusters everything they want to properly value the claim. Too often attorneys think it is adversarial. It doesn’t mean you’re rolling over on the client. I think of it as positioning the case, convincing the adjuster to value it properly and making sure they know I will file if they do not. Clients should not do this on their own or they risk getting tricked and saying the wrong thing to an adjuster. A lawyer skilled in dealing with adjusters however knows how cases are valued and without fear provides the adjuster with the proper medical records and opinions to show causation and injuries, and the proper wage loss, life care plan, vocational report and economic loss report to support a complex claim. Not every case needs or warrants this of course but a good lawyer is ready to provide it when warranted and simply file the case, litigate it further or even try it if necessary but only if the case cannot be resolved swiftly and at a good value for the client. Do not give a recorded statement to the opposing insurance company. Many times adjusters say that they’re just needing to get information and will record the call. If they were only needing information, then they would not need to record the call. The only reason to record the call, is to play the recording back at some point in the future to further their main goal of reducing the value of a claim. It’s an unfair fight; insurance adjusters are trained in obtaining recorded statements, whereas you are not trained to give one. After a wreck, if you are physically able and it is safe to do so, take as many photographs as possible of damage to your car, any other cars involved, any property involved (e.g., fences, buildings, guardrails, trees, mailboxes, etc. ), and injuries. One cannot have too many photographs or too much information. If you or a family member were injured, and have visible injuries, take photographs of your injuries, and do that every several days to document your recovery. Always call the police if in a fender bender, especially if it is not your fault. This helps to document the crash (when, where, how, why, etc.) and to obtain necessary information about the other driver. Inevitably, there is a dispute about the above, and a police officer may help resolve some of the disputed issues. If fault can or will be disputed, do not give them a statement and hire an attorney as the insurance company will take the most aggressive position possible against you. Even if fault is clear against their driver, and you are injured, immediately hire an attorney. Although this is not a criminal matter, be mindful that anything you say or do can and will be used against you. Insurance companies are in business to make money. You represent a cost. Their mission is to reduce costs. Hiring an attorney levels the playing field for you and ensures that you will receive the compensation required by law. Do not give a recorded statement to the other driver’s insurance company. You are under no obligation to do so. If you are not going to hire an attorney right away, the only time you should talk to the other driver’s insurance company is when you call to report the claim or confirm that a claim has been opened. Then only tell date, place and time and see #1 above. Then you should not talk to them again until you have either finished your medical treatment or been told by your doctor you have a permanent condition. Do not sign a medical authorization for the other driver’s insurance company. You are under no obligation to do so. Rather, gather all of your medical records and medical bills and separate them by provider. Then you send a complete set to the medical provider. Remember, the law says you are entitled to the reasonable value of your medical services. This means you are entitled to what was billed for your medical care, and not just what was paid or that you paid out of pocket. Report the accident to your insurance company just so they are aware. Get a copy of your insurance policy declaration page the lays out your coverage. If you have underinsured coverage you might be able to be compensated by it. Getting paid underinsured insurance by your insurance company doesn’t mean your rates will go up. You have a contractual right to these payments based on someone else’s fault (not yours) and you paid an extra premium for these benefits. Take pictures of the vehicles at the scene and the damage to BOTH vehicles. • If its your fault, report it to the insurance company. Be honest and cooperative. • If its not your fault and you are fine, report it to the insurance company. Be honest and cooperative. • If its not your fault and you are injured, consult with an attorney before speaking to either insurance company. The most common piece of advice given by the attorneys here is do not give a recorded statement to the insurance company. 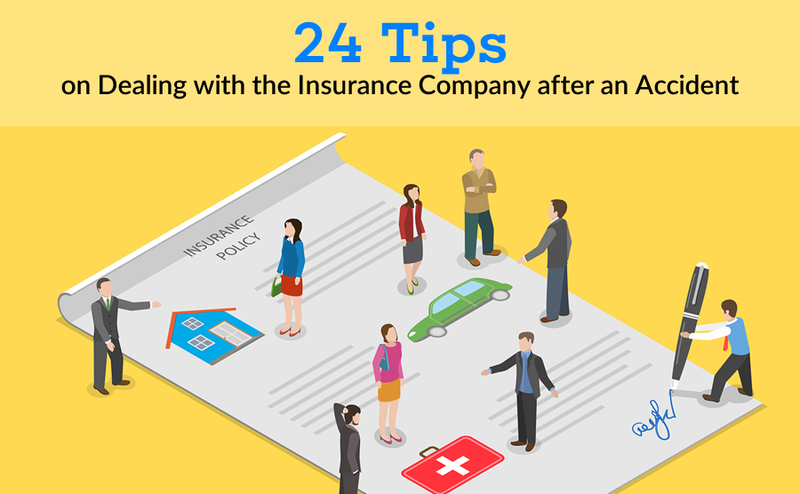 Keep these tips in mind if you, a friend or a family member ever has to deal with the insurance company. If you have any stories on dealing with insurance we’d love to hear about it in the comments below! Next post Which States in the U.S. Sue the Most? It’s nice to see such a large list of tips regarding an issue as common as personal injury resulting from an accident. 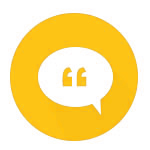 The consensus on having a lawyer present when speaking to the opposing insurance company (if even speaking to them at all) shows how important it is to have someone advise you when speaking on record. Thanks for sharing. I recently got into an accident and was terrified to handle the insurance company. I appreciate the advice about not giving a recorded statement. I’ll have to get a lawyer to help me out with handling the hoops of the insurance company. My car was totaled recently. A gal i let use the car actually hit a lady who ran a red light. The driver of my car had a green light and hit the other vehicle broadside. A woman came up to the car to make sure they were okay. She stated that she had called 911 and left her name and number with dispatch. She also said that she saw tthatmy driver had the right of way with a green light. The other driver said she had the green light so her insurance company contacted my cars driver and took a statement. I was there when it was taken. We didn’t know to not let it be recorded. There are some errors on the police report. The officer has my driver in the outside Lane she was in the inside Lane for one. I did get a copy of the crash report as well. There was a supplemental report filed that contained the information from the second 911 call which was the witness for my driver…it was taking forever to get that supplemental report and b4 i was told the woman was contacted and said she didn’t want her information given out… which they took as her not wanting to give a statement..i received notice that the other driver’s insurance was blaming my driver a hundred percent and she too had a witness. Now this woman, who was a witness for my driver, she was the only thing standing between my driver being at fault and the truth being told. I never did contact my insurance company I should have done that instead of trying to do it myself. I live in Minnesota and the insurance company for the other driver is out of state, possibly Illinois. Is there anything that I can do at this point to fix this? I should point out too that it was very strange..the lady that was driving the other vehicle is a 64 year old woman from that area, the police officer who arrived on the scene about an hour after the accident made several mistakes on the police report as far as where the vehicles were, they had my driver in the outside lane… she was in the inside lane and there was a video that was taken at the intersection and he never bothered to check it and when I tried to get a copy of it I was told that it only existed for 14 days and now they’re writing over it. I wonder if the woman who was driving that other vehicle is somebody that nobody wants to mess with because even my witness has backed out. Am I just being paranoid or could this be the scenario? Any information that you could give me as to what I could do from here would be greatly appreciated. I had an accident in April of this year. I was hit from behind by a company truck who claims to be changing lanes. His truck had a bent bumper and my car was also damaged. The impact made my seat belt lock and it was over my left shoulder which I had had surgery less than a year before. I have been getting treatment for my shoulder after the x-ray and MRI showed separation of tissue and bursitis. This last week, Thursday, October 25, 2018, on my way for treatment, I had a flat tire and pulled off the freeway to the service lane. My insurance sent a road service person to fix my tire. After he finished changing the tire, a man fell asleep on the wheel and hit me from behind. He totaled my truck and his and I was taken to the emergency room to check me out for injuries. Now I have another insurance company to deal with. How do I handle both as I have not yet settled from my accident in April? Thanks for your advice..